Dr. Trace Peterson studies mycobacteria infections in zebrafish. He was the first trainee under the NCRR training grant: Veterinary Training on Aquatic Models in Biomedical Research. What do people and fish have in common? As it turns out, quite a bit. One shared trait is that both can become infected by mycobacteria, a class of bacteria with a unique thick cell wall that provides a natural hardiness against drug treatments. In humans, mycobacteria are responsible for tuberculosis and Hanson’s disease (leprosy), both difficult to treat and often drug-resistant. Fish can also be infected by a wide variety of different mycobacteria. Understanding how these diseases progress and behave in fish can provide a better understanding of mycobacteria infections in people. Dr. Trace Peterson, a Doctor of Veterinary Medicine (DVM) and a doctoral student of Dr. Michael Kent, aims to do just that.He is using zebrafish as an aquatic model to better understand mycobacterial infections. But unlike a medical doctor who often interviews patients and looks for specific signs and symptoms of illness, fish disease research is trickier. Fish, especially zebrafish, with mycobacteria infections have very vague symptoms that can represent a wide variety of illnesses. So Peterson must observe how each mycobacterial disease progresses in fish, use a microscope to examine tissue samples of infected organs, grow the bacteria under different conditions, perform autopsies, and investigate the disease like a detective. In other words, he is a veterinary pathologist, someone who studies disease in animals. Even before becoming a veterinarian, Peterson knew he was interested in aquatic research, particularly fish and aquatic invertebrates. His fascination with fish began in childhood and lead him to pursue his DVM at Louisiana State University. Afterwards, he developed his pathology skills at Harvard and Angell Memorial Animal Hospital, and finally at the University of California at Davis where he met Dr. Ronald Hedrick. Knowing that Peterson wanted to pursue research further, Hedrick encouraged him to consider the OSU EHS Center and to speak with Kent, his former graduate student. Peterson found OSU, with its veterinary school and proximity to the Hatfield Marine Science Center and Oregon Coast Aquarium, to be a great opportunity to pursue his aquatic research interests and also felt that Kent would be a great doctoral mentor. Another attraction of the OSU EHS Center was the NCRR training grant available to veterinarians interested in pursuing a doctoral degree in aquatic animal research. Peterson is the first doctoral student trainee on this training grant and is grateful for both the financial assistance and mentorship from EHS Center investigators such as Kent. 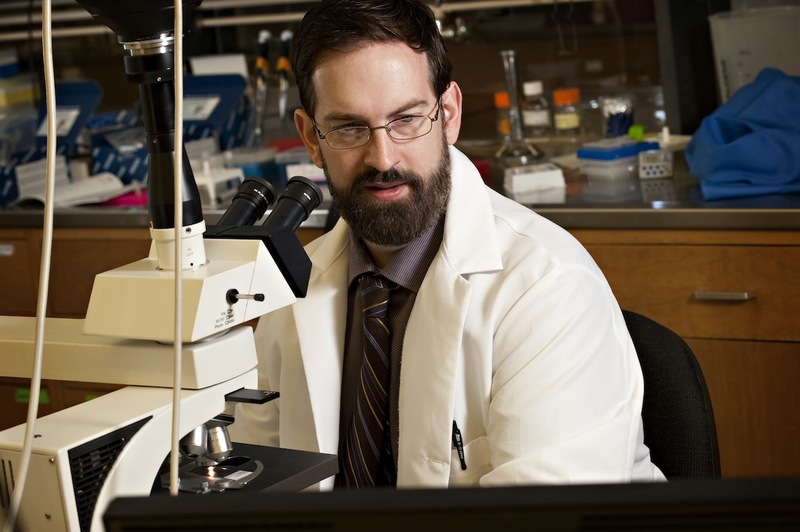 Upon finishing his graduate degree at OSU, Peterson will join the very small club of DVM-PhDs. With this rare dual-degree combination, he wishes to continue his research career in veterinary pathology aided by his advantage of having expert qualifications in fish pathology and health management. This training will enable him to fill the great need for specialists who understand fish disease processes and better enable him to interpret research findings.